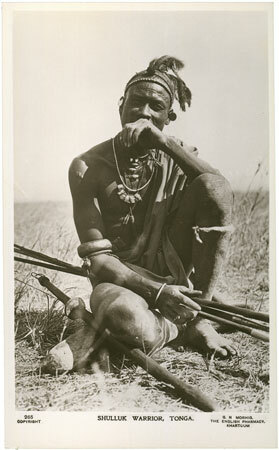 A postcard portrait of a Shilluk man sitting on an ambatch-wood parrying shield, several spears laid across his lap as well as a club with hand-guard. He is wearing a number of neck and head ornaments (including small leather charm cases?) as well as feather plumes, and rows of dotted cicatrices on his forehead. Notes on postcard - "265 Copyright. G.N. Morhig, The English Pharmacy, Khartoum. Shulluk Warrior, Tonga"
Morton, Chris. "Portrait of a Shilluk man" Southern Sudan Project (in development). 03 Jan. 2006. Pitt Rivers Museum. <http://southernsudan.prm.ox.ac.uk/details/1998.88.19/>.